WOW. Just.Wow. I can't even right now. Seriously. I may just write this entire review in sentence fragments. Because.I.Cannot.Deal. I'm not even sure I fully understand the implications of what was revealed throughout this book and especially at the end... My mind is still reeling. For real. I thought I was equipped for dealing with Sanderson and his mind-blowing revelations but I seriously can't even right now!! So. 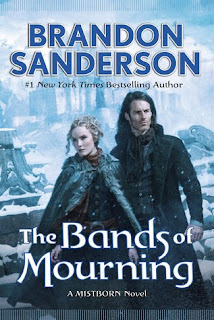 The Bands of Mourning is the latest installment in the Mistborn Series. That makes it book 3 in the new Western-Era sequel series featuring Wax and Wayne, and book 6 overall within the Mistborn Series as a whole. 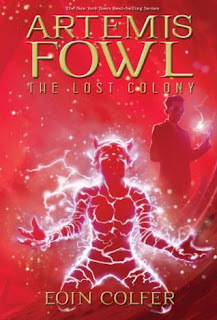 This new sequel series featuring Wax and Wayne started off innocently enough, but with every new book, it has become more deeply enmeshed in the mythos of the original trilogy. The connections to the first three books becomes deeper still here, effectively changing what we've held to be true these past YEARS. Obviously I can't go into specifics here but the fact that Sanderson has so clearly shook exploded the foundation of everything he built thus far speaks a great deal about his skills as an author - especially at the point we're at in this series! Plot-wise, things move at a very steady pace. Had real life not consistently insisted on butting in while I was reading this, I would have finished it much quicker. It felt much more thrilling than the previous installments in the Wax and Wayne series - probably because our ragtag group of heroes set off on an adventure outside of Elendel, and the Lord Ruler knows I'm a huge fan of journey-type adventures. Wax, Wayne, Marasi and Steris are searching for the mythical Bands of Mourning, items apparently crafted and worn by the Lord Ruler hundreds of years ago... and then hidden away. Items that could grant the wearer phenomenal cosmic power! As I mentioned, all of our favorite characters return here and having them all work together this time around was a real treat. The inclusion of Steris - whose character has grown in leaps and bounds throughout this series - was absolutely a highlight for me. As boring as she seemed in the first offering, she has quickly become a standout character amongst the group and I love her for sneaking up on me like that! Marasi has shown her fair share of evolution here as well and as always, I applaud Sanderson for writing strong, capable women. *slow clap* Wayne offers comic relief yes, but he likewise gained depth here especially. The way he reads people, studies strangers for the purpose of imitating them later is still fascinating to me! Not to be outdone, our main hero Wax has been through a hell of a lot, and it shows in The Bands of Mourning. He's angry, and a bit of a loose cannon but that makes him all the more enticing. All in all, these are a solid bunch of characters that I've grown to love almost as much as Vin, Kelsier, Elend and Sazed! I am too Mogsy!! Steris was a phenomenal addition and I loved her even more this time than I did with Shadows of Self! I know what you mean though, I can relate to her too :D The wait is going to be looooong for The Eleventh Metal but knowing Sanderson, it'll be worth it!! 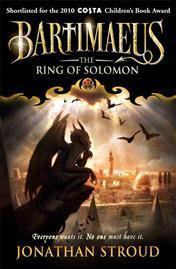 So I seriously need to read this series! I have all three from the original trilogy and now apparently I need to get my hands on these too. Awesome review! WOW, Micheline! You were totally rendered speechless by this story - which makes me WANT! Then my work here is done :D I hope you get into the series soon!! YAY! I'm so glad to see that you're loving this. I haven't started this part of the series yet, but I was a little concerned at how well it could match the epicness of the first 3. Sanderson really has a way with letting characters sneak up on you and become favorites. I'm happy to see that's happened here as well. I also love that you're totally blown away. It makes me so excited and curious to start reading these new ones. Great review! I know what you mean Jaclyn, I really enjoyed the first one but it didn't measure up to the first three! Then the next one was better and this one just blew me away!! 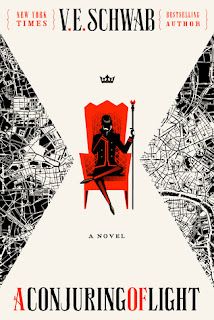 Yup, Sanderson is gifted with his characters...and his world building...and his plots XD I hope you read these soon Jaclyn, I need someone to gush with! Heh, great review! And you know it's a good book when it renders you speechless :) It's hard for me to grasp the exact epicness of the series having never read it, but you saying that Sanderson has exploded the very foundation of the everything he has built from the previous 5 books... I mean, that's crazy! Ahh, I do hope to begin my own Mistborn journey soon!! 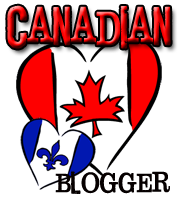 ohh a "WOW JUST WOW" "I just can't right now" fragmented review :) yay I LOVE THOSE! I read the first sentences and I have to go immediately to GR to make sure I have the book in my TBR list! So I'll be right back! LOL! The first three have their own story arc and then this series is set 300 years after. And this series isn't finished yet so you could easily stick with the first three for now ;) I'm really hoping you will read it soon!! I'm still amazed at how far Steris has come since her introduction in The Alloy of Law. If you were going to tell me then how important she was going to be to the group, I wouldn't have known then what to think. But she's fantastic, and that scene in the hotel when they first arrived cracked me up to no end! Are you far in on the Secret History? Oh man, the wait for the next book is unbearable. Sanderson has so many brilliant series on the go...sometimes I feel like if he focused on just one, we'd get a book every few months. But since I love ALL of his series' I don't want him to stop LOL! Secret History is finished and well, MIND BLOWN. I absolutely loved this. It may be one of my favorite Sanderson novels yet. I literally do not have the words to express just how much I adored this book. I'm in desperate need of the last book in this series now, but hey I think Stormlight #3 might be enough to tide me over until then! I loved the additional characters and the realizations that they bring with them near the end of the book. You can see where Sanderson was laying some marvelous groundwork for the next books, and I can’t wait to see how far the story will expanding now with whole new worlds coming into the mix.